With the Canada 5 year bond inching closer to a 7 year high earlier this week, pressures are mounting on fixed term mortgage rates. While many smaller lenders have increased their borrowing rates as a result, Canada’s big banks have been holding out. However, TD Bank was the first to flinch, announcing it is hiking it’s posted 5-year fixed rate a whopping 45 basis points (bps) to 5.59%, the largest increase in eight years. An additional 3% reduction in borrowing power on top of the most recent 20% reduction in borrowing power thanks to OSFI’s new B-20 Mortgage guidelines, otherwise known as the stress test. With rising rates and slumping home sales (national home sales dipped 16% in Q1 2018) the health and overall credit worthiness of over indebted households could soon be put to the test. 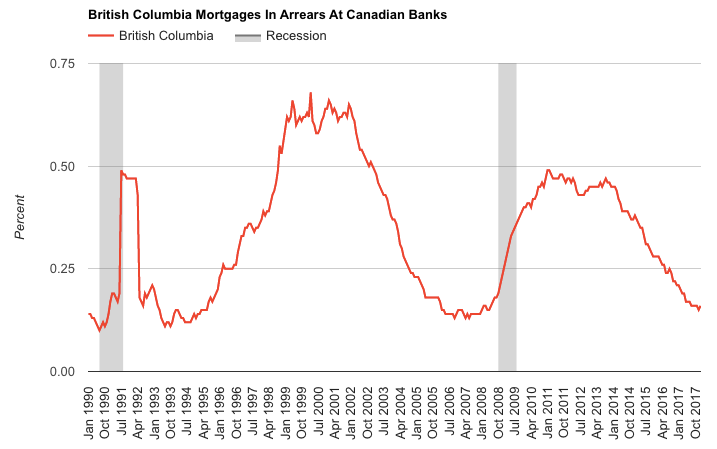 Mortgage arrears rates, a lagging indicator, held firm across Canada. Per Stats Canada and Better Dwelling, mortgage arrears rates held steady at 0.24% as of January, 2018. A paltry 11,641 mortgages fell into arrears at Canadian banks. That rate was even lower in the province of BC, where mortgage arrears rates represented just 0.16% of the total mortgage pool. Despite the eerily low arrears rates which now face headwinds of rising rates, tighter borrowing conditions, and weaker home sales, the Bank of Canada remains emphatically optimistic. “The fundamentals of the housing market remain very solid” quipped Governor Stephen Poloz earlier this week in his brief to the finance committee.